Sean John Combs (born November 4, 1969), also known by his stage names Puff Daddy, Diddy, and P. Diddy, is an American rapper, record producer, media executive, musician, actor, and entrepreneur. Combs was born in Harlem and grew up in Mount Vernon, New York. He worked as a talent director at Uptown Records before founding Bad Boy Records in 1993. He signed The Notorious B.I.G. and profited from the success of the artists he signed. He released his debut album No Way Out in 1997, which has been certified seven times platinum and was followed by successful albums such as Forever (1999), The Saga Continues... (2001) and Press Play (2006). In 2009 Combs formed the musical group Diddy – Dirty Money and released the critically well-reviewed and commercially successful album Last Train to Paris (2009). Combs has won three Grammy Awards and two MTV Video Music Awards, and is the producer of MTV's Making the Band. His non-music business ventures include the clothing lines Sean John and "Sean by Sean Combs" – for which he earned a Council of Fashion Designers of America award – a movie production company, and two restaurants. In 2012 Forbes estimated Combs' net worth at $550 million, making him the richest figure in hip hop. After dropping out of Howard University in 1989, where he had majored in business, Combs became an intern at New York's Uptown Records. While talent director at Uptown, he helped develop Jodeci and Mary J. Blige. In his college days Combs had a reputation for throwing parties, some of which attracted up to a thousand participants. In 1991, Combs promoted an AIDS fundraiser with Heavy D held at the City College of New York (CCNY) gymnasium, following a charity basketball game. The event was oversold, and a stampede occurred in which nine people died. In 1993, after being fired from Uptown, Combs established Bad Boy Records as a joint venture with Arista Records, taking then-newcomer The Notorious B.I.G. with him. Both The Notorious B.I.G. and Craig Mack quickly released hit singles, followed by successful LPs, particularly The Notorious B.I.G. 's Ready to Die. Combs signed more acts to Bad Boy, including Carl Thomas, Faith Evans, 112, Total, and Father MC. The Hitmen, his in-house production team, worked with Jodeci, Mary J. Blige, Usher, Lil' Kim, TLC, Mariah Carey, Boyz II Men, SWV, Aretha Franklin, and others. Mase and D-Block (then known as "The L.O.X.") joined Bad Boy just as a widely-publicized rivalry with the West Coast's Death Row Records was beginning. Combs and The Notorious B.I.G. were criticized and parodied by Tupac Shakur and Suge Knight in songs and interviews during the mid-1990s. During 1994–1995, Combs produced several songs for TLC's CrazySexyCool, which finished the decade as number 25 on Billboard's list of top pop albums of the decade. In 1997, under the name "Puff Daddy", Combs recorded his first commercial vocal work as a rapper. His debut single, "Can't Nobody Hold Me Down", spent 28 weeks on the Billboard Hot 100 chart, peaking at number one. His debut album, No Way Out, was released on July 1, 1997, through Bad Boy Records. Originally titled Hell up in Harlem, the album underwent several changes after The Notorious B.I.G. was killed on March 9, 1997. Several of the label's artists made guest appearances on the album. No Way Out was a significant success, particularly in the United States, where it reached number one on the Billboard 200 in its first week of release, selling 561,000 copies. The album produced five singles: "I'll Be Missing You", a tribute to The Notorious B.I.G., was the first rap song to debut at number one on the Billboard Hot 100; it remained at the top of the chart for eleven consecutive weeks and topped several other charts worldwide. Four other singles; "Can't Nobody Hold Me Down", "It's All About the Benjamins", "Been Around the World", and "Victory", were also released. Combs collaborated with Jimmy Page on the song "Come with Me" for the 1998 film Godzilla. The album earned Combs five nominations at the 40th Grammy Awards in 1998, winning the Grammy Award for Best Rap Album. On September 7, 2000, the album was certified septuple platinum by the Recording Industry Association of America for sales of over 7 million copies. In 1997, Combs was sued for landlord neglect by Inge Bongo. Combs denied the charges. By the late 1990s, he was being criticized for watering down and overly commercializing hip hop, and for using too many guest appearances, samples, and interpolations of past hits in his new songs. In April 1999 Combs was charged with assault as a result of an incident with Steve Stoute of Interscope Records. Stoute was the manager for Nas, with whom Combs had filmed a video earlier that year for the song "Hate Me Now". Combs was concerned that the video, which featured a shot of Nas and Combs being crucified, was blasphemous. He asked for the video to be pulled, but after it aired on MTV on April 15, Combs visited Stoute's offices and injured Stoute. Combs was charged with second-degree assault and criminal mischief, and was sentenced to attend an anger management class. With a gag order in place, the highly-publicized trial began. Combs' attorneys were Johnnie L. Cochran Jr. and Benjamin Brafman. Combs was found not guilty on all charges; Shyne was convicted on five of his eight charges and sentenced to ten years in prison. Combs and Lopez broke up shortly after. A lawsuit filed by Fenderson, who said he suffered emotional damage after the shooting, was settled in February 2004. Lawyers for both sides, having agreed to keep the settlement terms secret, said that the matter was "resolved to the satisfaction of all parties". In June 2001 Combs ended Bad Boy Entertainment's joint venture with Arista Records, gaining full control of Bad Boy, its catalogue, and its roster of artists. The Saga Continues..., released on July 10 in North America, was the last studio album released by the joint venture. The album reached number two on the Billboard 200 and the Top R&B/Hip-Hop Albums charts, and was eventually certified as Platinum. It is the only studio album under the P. Diddy name, and the first album by Sean Combs not to feature any guest appearances by Jay-Z or Lil Kim. Combs was executive producer of the reality TV show Making the Band, which appeared on MTV from 2002 to 2009. The show involved interviewing candidates and creating musical acts that would then enter the music business. Acts that got their start this way include Da Band, Danity Kane, Day26, and Donnie Klang. On August 16, 2005, Combs announced on Today that he was altering his stage name yet again; he would be calling himself "Diddy". Combs said that fans didn't know how to address him, which led to confusion. In November 2005, London-based musical artist and DJ Richard Dearlove, who had been performing under the name "Diddy" since 1992 – nine years before Combs started using even "P. Diddy" – sought an injunction in the High Court of Justice in London. He accepted an out-of-court settlement of £10,000 in damages and more than £100,000 in costs. Combs can no longer use the name Diddy in the UK, where he is still known as P. Diddy. An assault charge against Combs filed by Michigan television host Rogelio Mills was resolved in Comb's favor in 2005. In June 2008 Combs' representative denied rumors of another name change. 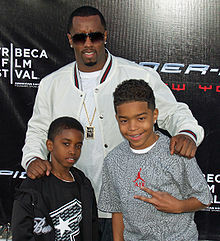 Combs ventured into reality television in August 2008 with the premiere of his VH1 series I Want to Work for Diddy. After the season finale of Making The Band 4, Combs said he would be heading back into the studio to record his next album. In an interview with The Daily Mail, he said, "I had Christina Aguilera on my last album, but its all about Leona Lewis on my next." He appeared—credited under his real name—in two episodes of Season 7 of CSI: Miami: "Presumed Guilty" and "Sink or Swim", in the role of lawyer Derek Powell. On April 18, 2011, Combs appeared in season one of Hawaii Five-0, guest starring as an undercover NYPD detective. In February 2012 he announced the launch of Revolt, a new music-oriented cable television channel which is expected to be in operation by the end of the year on several cable TV networks. The new company also has a film production branch. In November 2012 Combs appeared in an episode of the eighth season of the American sitcom It's Always Sunny in Philadelphia. Fortune magazine listed Combs at number twelve on their top 40 of entrepreneurs under 40 in 2002. Forbes Magazine estimates that for the year ending May 2012, Combs earned $45 million, ranking him fifteenth among musicians. In 2012 his estimated net worth was $550 million, making him the richest person in the hip hop entertainment business. In 1998, Combs started a clothing line, Sean John. It was nominated for the Council of Fashion Designers of America (CFDA) award for Menswear Designer of the Year in 2000, and won in 2004. The clothing line became the subject of controversy in 2003 when the National Labor Committee revealed that factories producing the clothing in Honduras were violating Honduran labor laws. Among the accusations were that workers were subjected to body searches and involuntary pregnancy tests. Bathrooms were locked and access tightly controlled. Employees were forced to work overtime and were paid sweatshop wages. Charles Kernaghan of the National Labor Committee told The New York Times that "Sean Puff Daddy obviously has a lot of clout, he can literally do a lot overnight to help these workers." In November 2008, Combs added a men's perfume called "I Am King" to the Sean John brand. The fragrance, dedicated to Barack Obama, Muhammad Ali, and Martin Luther King, featured model Bar Refaeli in its advertisements. In addition to his clothing line, Combs owned two restaurants called Justin's, named after his son. The original New York location closed in September 2007; the Atlanta location closed in June 2012. He is the designer of the Dallas Mavericks alternate jersey. In October 2007 Combs agreed to help develop the Ciroc vodka brand for a 50 per cent share of the profits. Combs acquired the Enyce clothing line from Liz Claiborne for $20 million on October 21, 2008. In February 2010 Combs announced to Wolf Blitzer on CNN that he plans to open a business school in New York. He announced that he wants the school to be "known for building leaders." Combs is the father of five children, and is the informal stepfather of Quincy Jones Brown (born December 1991), son of his on-again, off-again girlfriend Kimberly Porter with 1980s New Jack Swing romantic singer/producer Al B Sure. Quincy was featured on My Super Sweet 16. Combs' first child is Justin Combs (born December 1993), from a relationship with his high-school sweetheart, designer Misa Hylton-Brim. In January 2010 Combs presented Justin with a $360,000 Maybach car, complete with chauffeur, as a sixteenth birthday present. Justin was also featured on My Super Sweet 16. He is now attending UCLA on a scholarship, and will be playing football while there. Kim Porter is the mother of Christian Casey Combs (born April 1998) and twin daughters D'Lila Star Combs and Jessie James Combs (born December 2006). Combs and Porter ended their relationship in July 2007. In October 2007, Combs took legal responsibility for Chance, his daughter with Sarah Chapman. Combs owns a home in Alpine, New Jersey, which he purchased for a reported $7 million. His winter home in Miami Beach was purchased for id="mce_marker"4.5 million in November 2003. Combs founded Daddy's House Social Programs, an organization to help inner city youth, in 1995. Programs include tutoring, life skills classes, and an annual summer camp. Along with Jay-Z, he pledged id="mce_marker" million to help support victims of Hurricane Katrina in 2005, and donated clothing from his Sean John line to victims. He has donated computers and books to New York schools. Chicago Mayor Richard M. Daley named October 13, 2006, as "Diddy Day" in honor of Combs' charity work. He was given some cufflinks bearing the city seal. 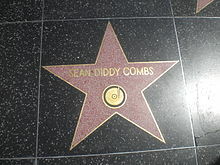 In 2008 Combs was honored with a star on the Hollywood Walk of Fame.